where and are integers. But what do you do with ?! Is it even defined? Well, turns out, it’s hard work, but there’s a twist to it. Let’s see how it’s done! We’re so used to our positional notation system that we can’t really figure out how to write numbers in other systems. Most of the ancient systems are either tedious, complicated, or both. Zero, of course, plays a central role within that positional system. But is it indispensable? In one of my classes, I discuss a lot of different numeration systems (like Egyptian, Babylonian, Roman and Greek) to explain why the positional system solves all, or at least most, of these systems’ problems. 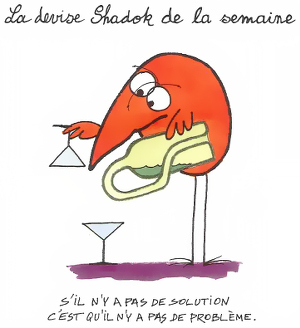 I even give the example of Shadok counting (in french) to show that the basis used isn’t that important (it still has to be greater than one, and, while not strictly necessary, preferably a positive integer). But can we write numbers in a positional system without zero? You are currently browsing the Harder, Better, Faster, Stronger blog archives for September, 2016.